For more than 40 years, baritone Thomas Buckner has dedicated himself to the world of new and improvised music. 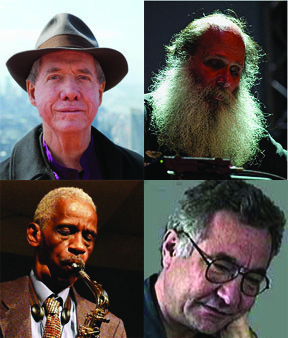 Buckner has collaborated with a host of new music composers including Robert Ashley, Noah Creshevsky, Tom Hamilton, Earl Howard, Matthias Kaul, Leroy Jenkins, Bun Ching Lam, Annea Lockwood, Roscoe Mitchell, Phill Niblock, Wadada Leo Smith, Chinary Ung, Christian Wolff and many others. He has made appearances at Carnegie Hall, Lincoln Center, the Herbst Theatre, the Art Institute of Chicago, the Ostrava Days Festival, the Prague Spring Festival, and the Sibelius Academy in Helsinki. Buckner is featured on over 40 recordings, including 6 of his own solo albums. His most recent solo recording “New Music for Baritone & Chamber Ensemble” includes works by Annea Lockwood, Tania Leon, and Petr Kotik. He also appears in the newly released CD/DVD “Kirili et le Nymphéas (Hommage à Monet)”. This recording documents the latest in his ongoing series of collaborations between the sculptor Alain Kirili and improvising musicians and dancers. For the past twenty years, Buckner has co-produced the Interpretations series in New York City. He also created the Mutable Music record label to produce new recordings and reissue some important historic recordings, previously unavailable in CD format. Earl Howard (born 1951) is an American avant-garde composer, arranger, saxophonist, synthesizer player and multi-instrumentalist. Howard is one of the pioneers of what is called “new” music. He has been in the industry for over thirty years. Howard has performed with Anthony Davis, Gerry Hemingway, Georg Graewe, Mari Kimura, Mark Dresser, Yuko Fujiyama, Evan Parker, Thomas Buckner, George Lewis (trombonist) and many of the other most prominent musicians in his field. Howard has received numerous awards including, a grant from Harvard’s the Fromm Foundation, a Regents Fellowship at University of California, San Diego, and three New York Foundation for the Arts Fellowships. In 2004 Howard's first sound installation was commissioned for the Tiffany Collection at the Queens Museum of Art. Earl Howard has also produced soundtracks for some major film and video artists including Nam June Paik, Mary Lucier, Rii Kanzaki, Bob Harris, and Bill Brand. Roscoe Mitchell is the rare jazz musician who also moves comfortably within the realm of contemporary classical music. It might even be said that Mitchell is a more convincing artist when working in European-influenced forms. When relying on structural and formal jazz conventions, Mitchell can often come off as stilted and unswinging. On the other hand, his forays into free-time, nontonal improvisation (both structured and unstructured) are as spontaneous and as emotionally satisfying as the best jazz. Mitchell's improvisations exercise extraordinary discipline and intellectual rigor. He's at once a patient and impulsive improviser, prone to alternating episodes of order and chaos, clarity and complexity. Mitchell is a technically superb -- if idiosyncratic -- saxophonist. His tone on alto and soprano tends to be edgy and brittle. At his most lyrical, Mitchell's saxophone lines exploit the instrument's strength as an interval-making machine; his improvised melodies often bear similarity to works by the classical composer Morton Feldman, though Mitchell's music is more overtly emotional. At his most energetic, Mitchell takes advantage of the saxophone's timbral flexibility and the horn's natural tendencies, which allow a player to play fast, scalar lines. Whether playing soft or loud, slow or fast, Mitchell's playing is invariably suffused with passion and intensity.